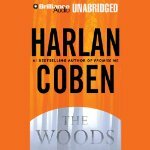 Scott Brick can make the phone book sound suspenseful so when he reads something by Harlan Coban the result is pure page-turner. Coban writes just barely this side of my graphic violence limit – the specific deeds are not related in gory detail, but the stories usually involve the resolution of some seriously unpleasant past crimes. So too with The Woods in which Peter Copeland, now the Prosecuting Attorney of a city in the New Jersey is involved in the trial of a couple of young rapists who have powerful fathers. Those fathers, or one in particular, are determined to bring the Prosecutor’s past to light and shine the worst part on Copeland’s part in it. Twenty years prior 4 teens went missing from a local summer camp. The bodies of two were found but the other two had to be presumed dead from various clues. Now one of the presumed dead has turned up dead for reals. What happened? Copeland and his sister Lucy were among the campers and Lucy was the other person “presumed dead.” Copland was also friends with Lucy, the daughter of the camp owner, Ike. Ike is now an aging hippie who in a rest home. Lots of juicy characters and plot twists.